Note: this post contains heavy spoilers for the original Steins;Gate anime. If you had the power to change the natural course of things for the better, would you do it? What if, even if the changes were a net positive, they ended up hurting someone? This is the question posed by the Steins;Gate anime, and ultimately by the trolley problem, a thought experiment in the field of ethics. 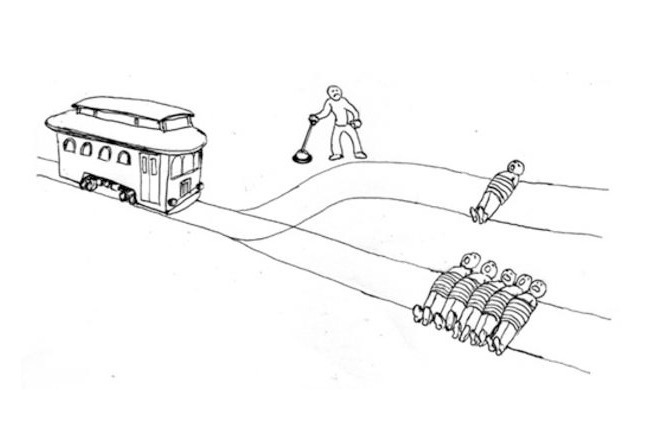 In the trolley problem, five people are tied to the tracks of a runaway trolley. You stand at a lever that, if pulled, will divert the trolley to another track, saving the five captives. However, there is a single person tied to that track. The problem asks people whether or not they would do nothing and let the five people die, or whether they would pull the lever, killing the one person. On paper, it’s easy to approach the problem from a purely utilitarian standpoint (cue the sounds of Gen Urobuchi breathing heavily), i.e., the correct choice is the one that results in fewer people dying. However, the model can be tweaked to amplify the moral ambiguity of the choice. One popular variant is the “fat man” variant, where instead of pulling a lever, you choose whether or not to push a fat uninvolved bystander onto the track to slow the trolley. Or the “fat villain” variant, where the fat man is not an innocent bystander but the man who tied the people to the track in the first place. However, they all ultimately ask the same question: is saving five lives worth taking one life? While these variations ultimately make the choice easier or more difficult by adding context, it simply emphasizes that ethical choices like this one aren’t always as simple as black-and-white as they seem. Steins;Gate takes this ethical dilemma and throws the wrench of time travel into the mix. Once the Future Gadget Lab accidentally creates a time machine, they end up using it to fulfill the wishes of the people around them. It’s only later that they find out that their meddling with time leads to the death of Mayuri. Due to causality (i.e., certain actions will always lead to the same outcome, regardless of what path is taken to reach the outcome), Okabe is unable to keep Mayuri safe and must reverse the changes they’ve made to the timeline in order to undo the events that led to Mayuri’s death. The variation of the trolley problem in Steins;Gate is unique in three ways. The first is that the choice is not as numerically clear. On one metaphorical track is Mayuri, a friend Okabe holds dear. On the other track are a variety of desires from friends, of varying degrees. For example, Suzuha wants to meet her father, Ruka wants to be female because he dislikes his body and wants the opportunity to receive Okabe’s love, and Faris’s father was killed and she wants to bring him back. Furthermore, some of the changes Okabe would be forced to make to save Mayuri would be net positives. The second important distinction is that the involvement of time travel complicates the standard setup. It’s a convoluted scenario where Okabe has (metaphorically speaking) first diverted the train, and only then discovered there was someone on the other track. He’s then given the option to do the whole thing over, only in this case, he’s the one who’s tied everyone to the tracks. Okabe is not an innocent bystander choosing between strangers. He’s a man forced to make a hard decision of his own creation. What’s more, there are arguments to be made that meddling with time is something that shouldn’t have happened in the first place, and the complication that his well-intentioned meddling in natural forces was wrong in the first place. The final distinction is that, due to the nature of how time was changed (i.e., Okabe provided his friends with the means to make changes but doesn’t know the specifics of how), he is essentially asking for consent to condemn the people on one track to save the one person on the other. The result of these three things is that the decision becomes less clear-cut and far more personal. When he asks Ruka to return to being male, he’s crushing her dreams of being together with Okabe. When he asks Faris to return the timeline to how it was, he’s essentially asking her to let her father die. And when he realizes that preventing Kurisu’s death affected the timeline as well, he’s forced to choose between two dear friends. Every decision is a painful one as Okabe repeatedly makes a decision between two unpleasant outcomes. The anime’s ultimate decision is for Okabe to save Mayuri, though from my understanding, the visual novel highlights this dilemma by forcing the player to decide where they would draw the line. Is Mayuri’s death a noble sacrifice necessary to create a better world for others? Is it too cruel to ask one to die so that the lives of many others may be drastically improved? If you’ve started undoing the good for Mayuri’s sake, do you have an obligation to follow through until the end? It’s a complicated web, and while I thought Steins;Gate had its issues, I can at very least appreciate the ethical dilemmas it posed. Note: Special thanks to BoogiePunk for creating the header image for me. 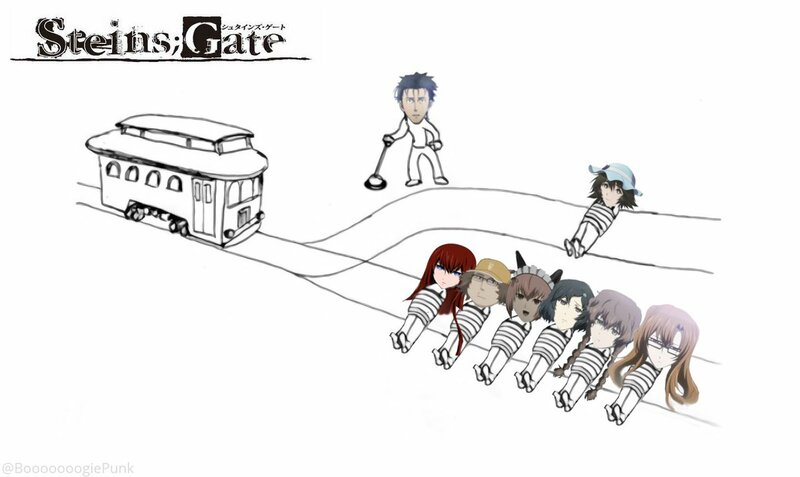 I put out a vague call for “a version of the Trolley Problem image with Steins;Gate characters” and off of that he nailed what I was looking for perfectly. Nice post and good explanation of the moral problem for the character. Steins;Gate certainly does get you thinking about the what if and the endless combinations of choices that might have been made. I’ve never held the original Steins;Gate as close to my heart as it seems many have. To me It’s perhaps the textbook example that I think is at most “fairly good” but never really think about other than when someone asks my opinion on it. I do think that the ethical decision is probably the most interesting part of the show, which is why I’ve been so pleasantly surprised by Steins;Gate 0, since I think that it’s characterization of Okabe reads as a realistic exploration of how the trauma of his choices would affect him. Thank goodness for Karandi or I would have missed this wonderful post! I was literally just picturing the visual included at the top in my head, and I had to google “steins gate trolley problem” to see if anyone else out there has compared in depth the insane similarity between the plot of Steins;Gate and this philosophical dilemma. Great analysis!